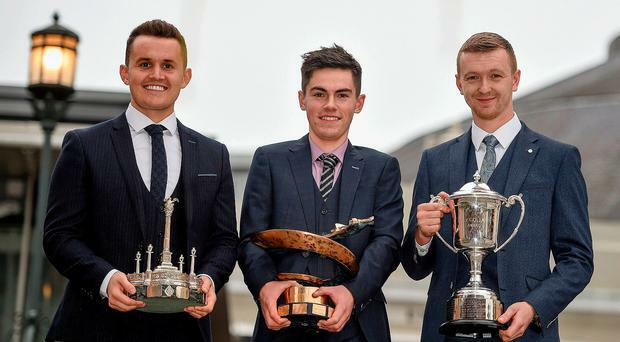 Two rising Ulster stars, Charlie Eastwood and James Wilson, carried off the Young Drivers of the Year accolades at the Motorsport Ireland awards lunch in Dublin. Eastwood, from Belfast, was named Young Racing Driver of the Year for 2018, collecting the Sexton Trophy and the €50,000 prize which he will use towards his 2019 programme. Wilson, from Armagh, was chosen as the Young Rally Driver of the Year, and picked up the Billy Coleman Award along with a similar €50,000 bursary. They had been shortlisted as a final group of three in each category from drivers nominated for their performances throughout the past season. Runner-up last year, 23-year-old Eastwood took the award ahead of fellow finalists James Roe and Cameron Fenton. He is currently driving for the TF Sports Aston Martin team in the GTE Am class of the World Endurance Championship as well as the Blancpain European series. He has achieved three second places from three races in his WEC debut year and is on track to add to his World karting and Porsche Carrera Cup GB Championship titles by the time the series finishes at the Le Mans 24-hour in June 2019. Wilson (24) was originally nominated for his performances in January and February of this year and went on to further successes throughout the season, emerging as the Valvoline National Forest junior champion. He also secured a podium finish in the Junior British Championship on the Ypres Rally in Belgium. The final rally shortlist included two other Ulster drivers, Jordan Hone and Jason Black. Jordan Dempsey, who pipped Eastwood to the Young Driver award in 2017, was named International Driver of the Year for his performances in the Far East where he won the FIA F4 Chinese Championship. The JC Millard Memorial Award for Clubman of the Year went to Kevin Barrett for his contribution as a competitor, organiser and sponsor.